We’re up so high on this mountain that we’re literally working with our heads in the clouds. It’s like trying to work in a really dense fog where you can only see a few feet in front of you. It makes it pretty difficult to “sag in” wire. The poles are several hundred feet away from each other, and it can be a real challenge to tell what the wire tension is when you can’t see the span clearly. Sometimes the clouds will hang out for an hour, and sometimes they’ll blow through pretty quickly. It’s rained on us a little bit too, but it’s usually light and doesn’t last very long. There are about 40 villagers working with us. I’ll tell you what – I thought I was a hard worker until I met these people! They’re pulling wire into the valleys where the elevation drop is incredible. And when it’s time to move on to the next location, they pick-up our bags and tools and carry them for us. I don’t know how we could ever do this job without them. The translators travel along with us so we can coordinate the work of the villagers. Many of us are starting to pick up a few basic Spanish words, but I don’t expect we’ll be fluent any time soon. I find myself anxiously waiting for the daily updates! It’s so neat to follow your progress and stay in touch. Words can’t express how proud I am of each of you and the work you are doing! I can’t wait to hear your stories and see more pictures when you return. Extraordinary men on an an extraordinary mission. Thank you. Great post Trevor. Keep up the good work and stay safe. I’m proud of you guys. Dad and I enjoy every word sent our way. 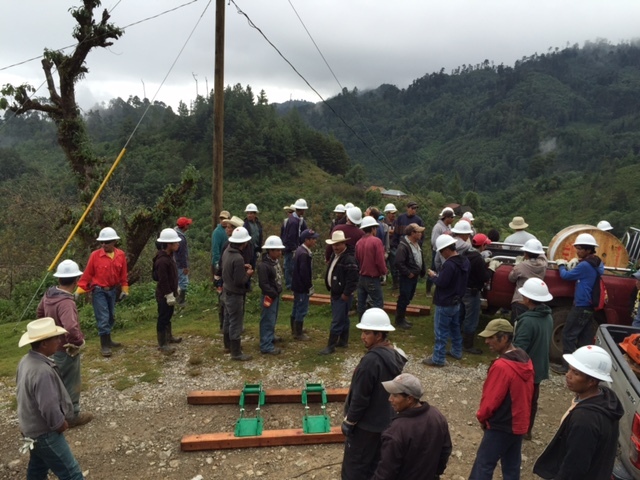 We appreciate your description of the work and how the environment in Guatemala effects it. So delighted to hear about the good relationship with the people!!!! God bless everyone involved with safety and joy!!!! Proud of you men giving to those who have nothing to help them. Work safe and God keep you all in his care. What a beautiful thing, to be offered the kindness and hospitality of these people, while offering them your skills and the gift of electricity. It is truly a partnership that you are experiencing – and it is sure to be a life altering partnership for all parties involved. So proud of you, Trev!